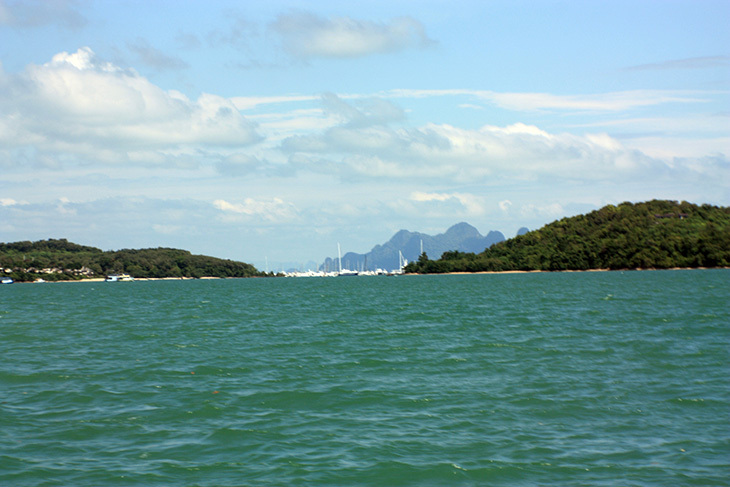 Speedy Phuket Trip: And I Survived. My Italian Chef and Rally friend, Umberto, at Ciao Bella, said “I’m taking the speedboat to Phuket tomorrow, why don’t you come with me?” Well, it should be a new experience, I thought, so why not? “Breakfast at 7, boat at 7:50” he said. That was “a.m.” and I’m not a morning person. Never mind. I set my alarm just in case. It didn’t go off. I’d set it for 5:50am … for one day next week. Luckily I was awake in time to witness it not going off. 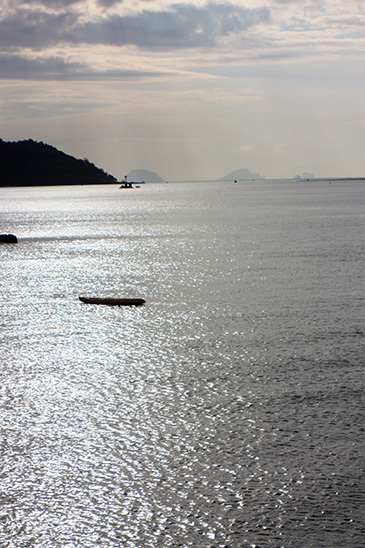 The morning views at Manoh Pier were very pleasant. Tickets were purchased, and we boarded. Easier said than done. There was about a 50cm drop from the pier to the boat, and then the steps were vertical. The crew was clearly used to people thinking “This is going to end in disaster” and everyone, old, young and in-between, was given a helping hand. Gently we moved away from the pier. 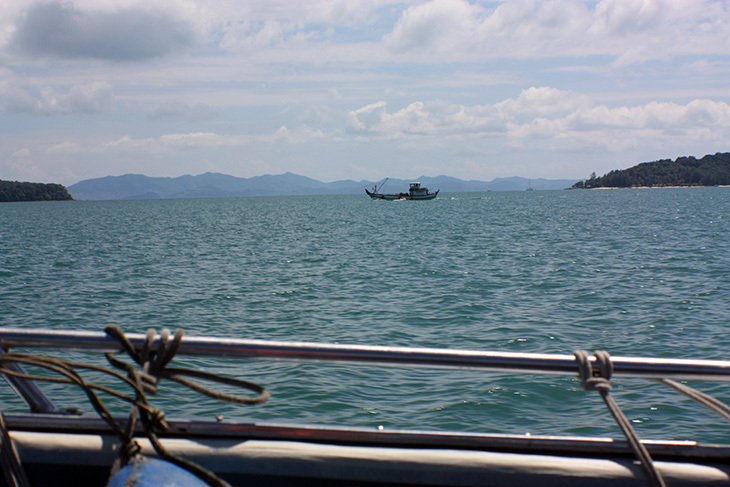 Equally gently we moved away from other speedboats, and the pointy end was aimed straight out to sea. 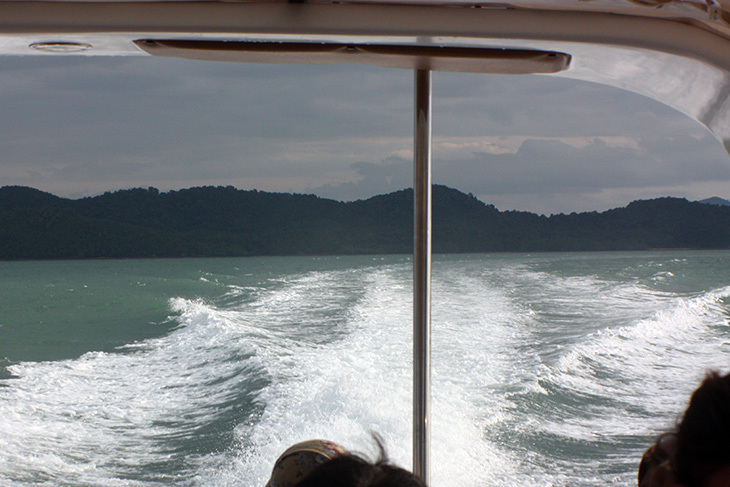 Then the “driver” pushed some levers, and we were propelled at a great rate of knots out into Phang Nga Bay. I did say speedboat. I wasn’t kidding. Umberto opened up an app which claimed we were going exactly 60kph. On water, that’s not slow. My preference would have been to sit outside at the front, but the seats were already occupied when we boarded. Oh well, when we go back, I thought. The constant unwavering hum from the three Hondas outboards was somehow comforting. The crossing was smooth, and seemed to be over before it had begun. Fifteen minutes including un-docking and docking. I figured getting off would be a whole lot easier. Going up steps rather than down, doesn’t seem to have the same risk factor. I wasn’t wrong. 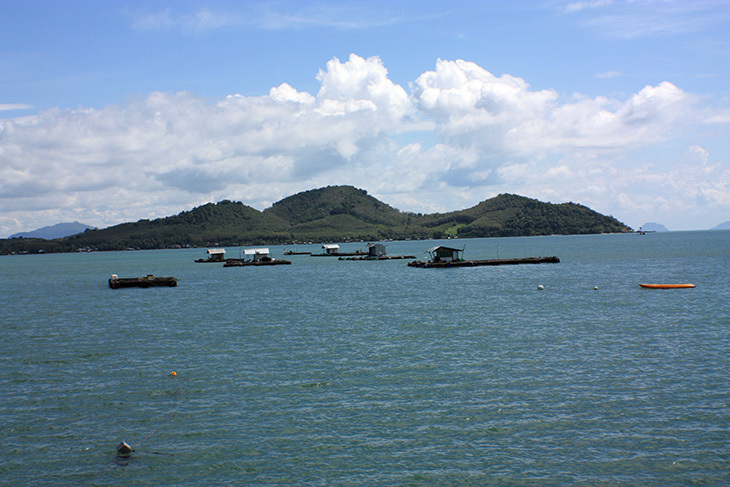 But, as so often happens, the boat was tied to another boat and another boat and then the jetty. Boats were connected with long wooden planks barely wider than a adult foot. Everyone else sailed across them like they were crossing a wide footbridge. Oh well, I thought, if they can do it so can I. And I did. Now, the box said it was wine. The bottles looked suspiciously like they contained wine. So we had to say “Yes, it’s wine.” “Oh, then I have to charge you extra” she said. Having lived in a Muslim environment for close to thirty years, I’m quite familiar with and respect Muslims’ wish not to touch alcohol, nor anything containing alcohol. I would not have been surprised if she’d said “You can’t take those on the boat.” But charging extra seemed like using religion as excuse to make money. I don’t think the Prophet Muhammad would be impressed. Anyways, the surcharge was paid, and this was offset by the lady suddenly announcing that as KYN residents we could get a discount on the ferry tickets. 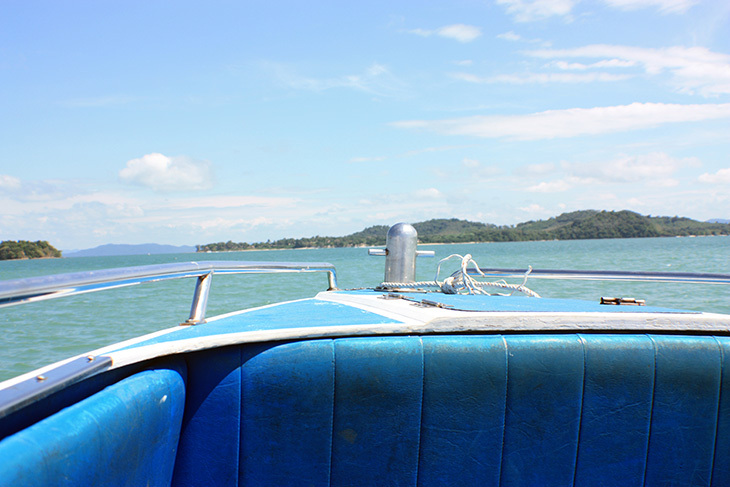 …who was arriving on another speedboat, was waving frantically at me to take her photograph. Which I did. And then after she’d climbed the stone steps from the boat, came over and said “Thank you.” The logic for this escaped me then, and does now. She thanked me for a taking a photograph of her she’s never going to see. Oh well. This is Thailand. 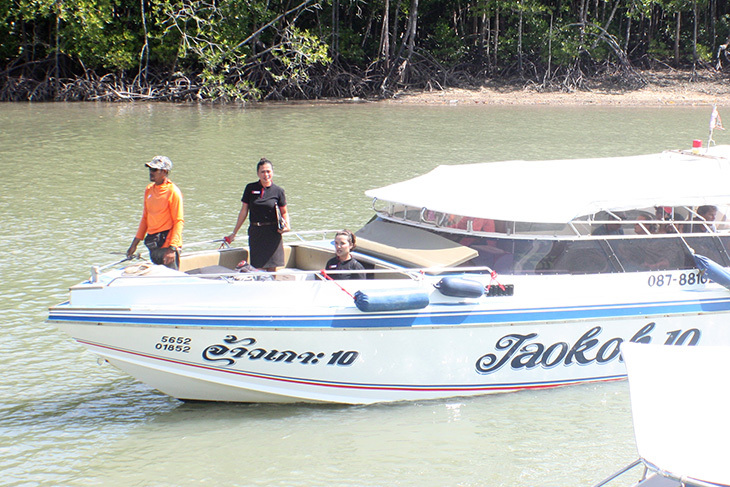 So it was back down the vertical steps, with help, onto a smaller speedboat. I immediately plopped myself onto the outside seats in order to take photos. I was given a life jacket. Because I was sitting outside? Nope, everyone had life jackets. This is ominous I thought. 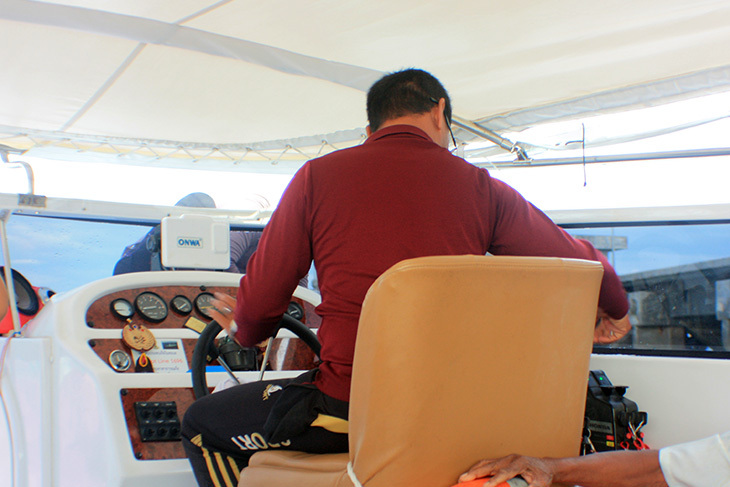 The law says everyone on any boat should wear a life jacket at all times. But Thai laws say lots of things that Thai people totally ignore. But life jacket was donned, we did the gentle undocking thing, followed by the now familiar whoosh as we got up to speed. This was closely followed by being thrown up the air and landing with a bang and being thrown up into the air, etc. After which I had to stop, so I could hang onto something. I was in imminent danger of being thrown overboard. “Get inside” a little voice in my head said. Another thing that was easier said than done. The entrance to the boat was through a bizarre tunnel only about a meter high. Crouching and bouncing didn’t seem practical. The “driver” must have realized this, as he momentarily cut the engines while a crew member unceremoniously grabbed me and dragged me through the “tunnel.” Now I know how Alice felt. The Mad Hatter, or was it Umberto, said something, but as the King of Hearts had cranked up the motors again, I’ve no idea what. After that it was a white knuckle ride, hanging onto the seat, as we hit wave after wave, slowing down, speeding up, slowing down. The fifteen minute ride probably took sixteen minutes, but it felt a lot longer. We were unloaded, boxes were unloaded, truck was brought, boxes were loaded and delivered to the restaurant. And thus ended a perfectly normal morning of island life.